In honor of the Seattle Seahawks reaching the Super Bowl again, I’m changing my name to Ed Friedhawk for this blog post. Everybody’s doing it, including Washington State Ferries. They announced that Gov. 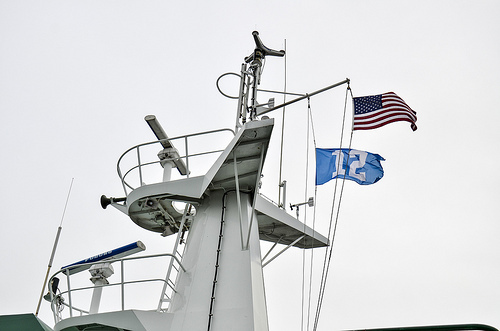 Jay Inslee directed them to honor the team by renaming the ferries after Seahawks players on Sunday. The M/V Tacoma will become the M/V Jermaine Kearse, for example. That makes sense. Kearse is from Tacoma’s Lakes High. I hope it doesn’t jinx him, though. The Tacoma went dead in the water off of Bainbridge Island in July after an electrical explosion and is still on injured reserve. Outside of the Tacoma, there was “no rhyme or reason” to the renaming of the other boats. It’s just coincidence that the Bainbridge route, which conspiracy theorists claim always gets the best of everything, wound up with Marshawn Lynch (Puyallup) and Russell Wilson (Wenatchee). Conversely, Bremerton got Will Tukuafu (Cathlamet). Will Whoafu? He’s actually pretty cool. The huge fullback — 6-foot-4, 280 pounds — blasts open holes on Lynch’s runs. If he misses a block, Beast Mode runs them over anyway. Bremerton’s other boat, the Kaleetan, will be the “Angry” Doug Baldwin. The city and receiver both have huge chips on their shoulders. Kingston gets defensive superstars Richard Sherman (Spokane) and Earl Thomas (Walla Walla). Running the Southworth route will be cornerback Byron Maxwell (Evergreen State), offensive tackle Russell Okung (Issaquah) and defensive tackle Kevin Williams (Tillikum). Washington State Ferries ridership has bottomed out and is headed back up. The agency on Friday released numbers that showed the largest rider jump — 2.7 percent — in at least 14 years. That’s when it lost license tab revenues, and started jacking up ticket prices and trimming service. The 2.7 percent calculates to 650,000 riders, enough to fill 260 of its largest ferries. Total 2014 ridership was 23,193,660, nowhere near the 1999 peak of 26.8 million but moving in that direction. Its the second straight gain (1.5 percent last year) after 13 years of declines. Drivers were up 1.3 percent and passengers 3.9 percent. Bremerton led the way with a whopping 10 percent gain. Passengers were up 12.6 percent and vehicles 3.2 percent. Bainbridge rose just half a percent, but remained the busiest route at 6.3 million riders. Edmonds-Kingston and Mukilteo-Clinton continued their annual duel for second. Kingston, boosted by a 3.6 percent gain, edged Mukilteo in 2014, 4 million to 3.9 million. Traffic picked up less than 1 percent at Mukilteo-Clinton. Mukilteo, however, led the system with 2,151,070 vehicles, followed by Kingston at 2,098,533 and Bainbridge with 1,953,466. Two-thirds of Bainbridge and Bremerton riders were passengers. The Fauntleroy-Vashon Island-Southworth route showed little change, at 0.3 percent. Judging from the comments on my Seahawks fast ferry story, some facts are in order. The low-wake ferry Rich Passage 1 is owned by Kitsap Transit. Washington State Ferries has nothing to do with it. A half-hour trip to the NFC championship game would largely be promotional, although it could slightly reduce crowds on the car ferries. It can carry just 118 people. The RP1 needs to be operated periodically, anyway, to keep it in good running order. Bremerton Mayor Patty Lent thinks it’d be great to kill two birds with one stone. She’s not shy about fast ferries. Like many others, Lent thinks they’d be great economically for the city and surrounding area. Many also disagree. With a proposition to run fast ferries full time possibly going on the ballot in the next year or two, she wants to showcase them as much as possible. Nobody would make a killing on the Seahawks trip. Lent and Kitsap Transit are just trying to cover expenses, primarily crew and fuel, as the feds require. The $25 round-trip ticket wouldn’t bring in half of the $7,000 needed. That’s why Lent’s looking for sponsor organizations. I’d think they’d see it as advertising. Neither the city nor Kitsap Transit would be footing any of the bill. Nobody is being forced to ride the boat. Car ferries will be available for about $8 for the round trip. If voters did eventually approve the service, tickets of $25 would be too high to be competitive with the state. Kitsap Transit is thinking more in the $12-13 range. That would cover 25 to 30 percent of operating costs, so a tax increase would be needed. If you’re headed to Seattle Saturday for the big Seahawks game or any other reason, it might help to know which boat you’re catching. At Bainbridge, it doesn’t really matter. Both the Puyallup and Wenatchee carry 202 cars and 2,500 people. There are different-sized boats running in Bremerton, however — the 124-car, 1,200-passenger Cathlamet and 144-car, 2,000-passenger Kaleetan. Kaleetan is scheduled to depart Bremerton at 11:10 a.m. and 1:45 p.m. Cathlamet is scheduled to depart Bremerton at 12:20 p.m. and 3 p.m. The game starts at 5:15 p.m. Washington State Ferries will add an unscheduled 11:30 p.m. sailing to Bremerton. Passengers are advised to beat the rush by taking an earlier sailing and purchasing return-trip tickets online in advance. The fast ferry Rich Passage 1 could also be an option, but they departure times and ticket-buying plan haven’t been determined yet. At last look, there would be one trip to Seattle and one back, each for $2, in the 118-seat Rich Passage 1. It can make the crossing in about a half hour. I should know more later this afternoon. Port Orchard Mayor Tim Matthes, in a bit of a coup, lost his seat on the Kitsap Transit board last month to city councilman Rob Putaansuu. Putaansuu had been serving the board as an at-large member. He said the board owes it to the public to ask whether they want cross-Sound ferry service because of all of the time and money invested in building the low-wake Rich Passage 1. Matthes isn’t enamored with the boat. Not being a board member didn’t prevent him from saying so. During the public comment portion of Tuesday’s meeting, he read a critical letter he’d written. He said the list of mechanical problems grows with nearly every sailing and there are safety issues. If the foil or strut had a breakdown at high speed, the ferry could dig into the water and splinter like hydroplane at Seafair. “Passengers and crew would be thrown around the cabin like rag dolls, causing injuries and loss of life,” he wrote. Time has run out on the Art Deco ferry Kalakala, which wobbled between Bremerton and Seattle for 35 years. Tacoma industrialist Karl Anderson, who wound up with the Silver Slug through foreclosure in 2012 and has been barely keeping the rotting, rusting vessel afloat, plans to scrap it. He’ll have it towed to a nearby graving yard on Jan. 22, according to a story in The News Tribune. Anderson was just being a nice guy when he let dreamer Steve Rodrigues moor the Kalakala on his company’s property on Hylebos Waterway. It had already been booted from Seattle’s Pier 66, Lake Union and Neah Bay while awaiting restoration. Rodrigues wasn’t good about paying the cheap moorage or maintaining the boat, so two years ago Anderson foreclosed on it. He didn’t want the Kalakala, but hoped to prevent it from sinking and fouling the bay. He’s spent $500,000 keeping it safe and secure, and will put out at least that much on demolition. It’s hard to believe what happened to the cool ship. Washington State Ferries sold it in 1967 to an outfit that towed it to Dutch Harbor, Alaska, and turned it into a crab processing operation. In 1971, it was sold again and towed to Kodiak for use as a fish cannery. It was abandoned when the operation failed. It just sat there until a Seattle artist had it towed home to Seattle in 1998. It was in awful shape and nobody ever succeeded in raising the funds to restore it, though there was much talk from several cities, including Bremerton. I was 12 when the Kalakala stopped ferrying people. I don’t remember riding on it, but my mom and dad and a whole lot of you do.